My mom came up with the concept and text, and I did the illustration. 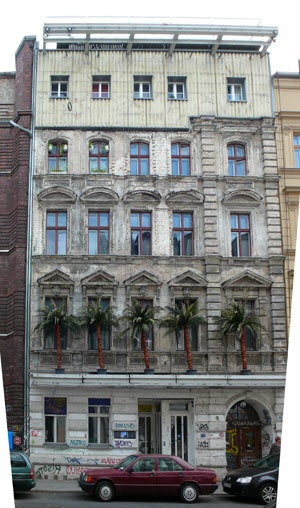 The project was commissioned by DAAD (in English, the German Academic Exchange Service). My mother is in Berlin for a year on a residency sponsored by DAAD. This is the second large public art collaboration I’ve done with her, the first being part of the MAK Center’s “How Many Billboards?” project from last year. Lazy as Germany between the first and second world war or the USA as they lived at the expense of the poor Arab economies, African or Latin America? I would like to ask the people of Berlin whether they think the building looks better covered with this billboard. As a European I feel sad looking at this cartoon that reproduces negative stereoptypes instead of fighting them back. Irony ???!!! Do you know iberian people ? Do you live here with us anytime ? Do you know our history ? Do you know that Colombo it was portuguese ? Portuguese people is the people that given new worlds to the world like your. Irony ??!!! When you compare a people with a pig, is this irony ? Nooooo ! It’s unrespect . The portuguese people is a very ancient e respectable people just one thoushand years and is an honorable people that works a lot and very hard to a better world. Just some century, more years than your country exists. Dear José, please read my original introduction above the cartoon: “PIIGS” is an acronym used by international bond analysts, academics, and the economic press to refer to the economies of Portugal, Italy, Ireland, Greece, and Spain in regard to sovereign debt markets.” The cartoon is IRONIC. 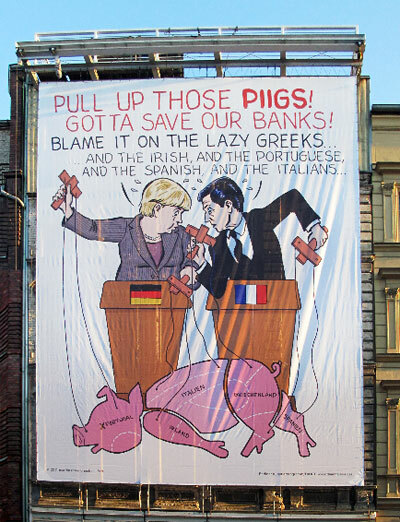 It is satirizing Germany’s Merkel and France’s Sarkozy for their cynical “rescue” of the European banks. 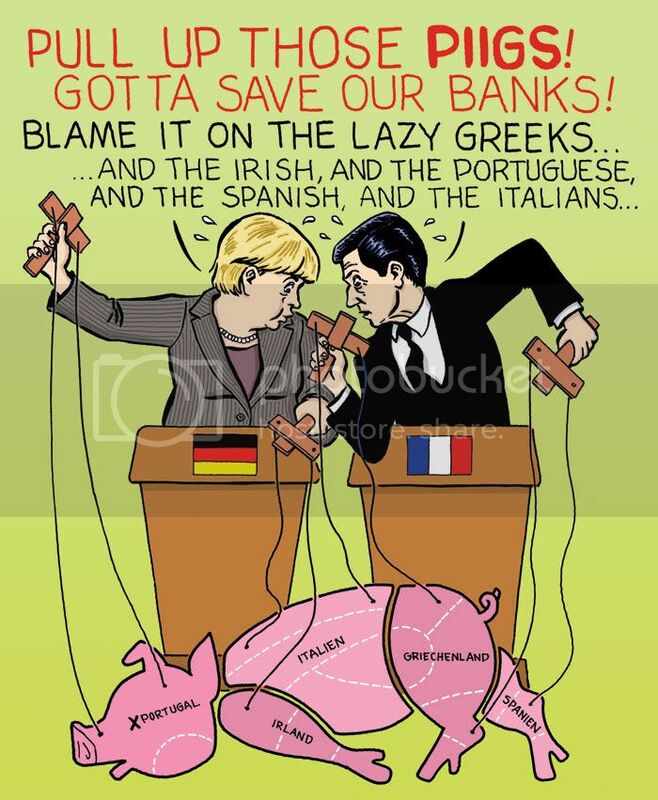 The cartoon has no point of view about Italy, Ireland, Greece, Spain — or even your beloved Portugal. P.S. Having to explain humor is the best way to rob it of it any power. Loved it. Keep up the good work. Of course we know the meaning of the acronym and I am aware that you didn’t mean to call pigs to the countries that are identified that way. But the issue deals with very sensitive matters, in a continent with a very very long and traumatic history. Less than one hundred years ago two bloody wars were staged in Europe, based on nationalisms and prejudice. Yes, I know that the U.S.A. also came to assist one of the sides, but your territory was not a battle of field. You have to understand that what you state as irony can be seen by us as the expression of stereotypes, which dervive from prejudice. You say the cartoon has no point of view about Italy, Ireland, Spain and Portugal. But the fact is that the adjective “lazy” is there to qualify all of them. And, yes, it corresponds to the idea that stucks on public opinion of the richer countries. As an artist you are of course free to interpret reality as you want, and we as observers are free to interpret the product of your work. Assuming that our interpretation has a certain mindmap in the background, for sure! Beyond your cartoon, produced in a certain context, and beyond our views about it and your own view, I really would like to know the impact it is having on the common people who look at it in Ausguststrasse in Berlin. P.S. I agree with you about explaining houmour… but the picture is being spread in the internet I could not stay indifferent. The writer, Martha Rosler, chose the words — including “lazy” — quite consciously. We are quite aware of the various stereotypes common in Europe (and have quite a number of similar stereotypes in the U.S.A. as well). We also know about World War I and II! You’ll notice it’s “Merkel” and “Sarkozy” who are saying the words. It’s our view that art is meant to provoke, to be confrontational, and, yes, even to occasionally anger the viewer. That’s the whole reason Martha chose to use the occasion of designing a giant poster to be shown in the streets of Berlin to confront many Germans with their own prejudices about the “PIIIG” countries. Anália… muito bem dito! Very well said! It’s interesting that by now, only the portugese have felt insulted with this pic… Where are the spanish, italians, irishs and greeks? We as a people have a lot of “issues” with our identity… I gess that is our biggest weekness… All the rest of the PIIGS… Just don’t even gave a f*** to this pic!!! “Pull up those PIIGS” is a cartoon that involves nations, people with a common history and many stories, often traumatic, it is not easy to work with that size and visibility, in that country, with that content, without raising ghosts. Maybe because you are not european, from countries involved, you do not quite understand this question. Concerning the financial crisis and the sovereign debts that have inspired you and your Mother, a lot could be argued… but I am not an economist, nor an opinion maker, so I leave it to the experts. As to the position of Andrea Rocha, let me just tell her and you that Portuguese guest workers are highly appreciated in the many countries where they are settled. It is much more a matter of leadership. Within the country there is may be a general attitude of suspicion towards leaders and politicians in general for historical and social reasons. But for a small country not rich in natural resources we’ve done a lot in our history. And we still do, there many success stories both at home and abroad. Sorry for having disturbed you, Josh. As you said, it’s just that I felt provocated by your enormous cartoon and I reacted. And again, I would like to have an idea if the reception of your work in Berlin… If you know of any commentary in the press I’d be very grateful if you send it to me by mail. Thank you. About the sovereign debts of some European countries now under the soptlight, I would like to draw your attention to an interview given by a German economic historian to the newspaper “Der Spiegel” (link below). Chanceller Merkel should learn more about History. Instead of rescuing banks, they should be concerned about rescuing people. I am portuguese, I have sense of humour, I am a bit lazy and we’re done with the presentations. Although not extraordinary, the picture is humorous. The portuguese have the exclusive on self deprecating speech and very angrily don’t admit it from anyone else. This is so much so that even when confronted with something else that refers to the portuguese, like the banner above, they tend to see in it an insult that, therefore, violates their exclusive. In Portugal there are smart people, there are stupid people. I guess the same goes just about everywhere. Here, in this comment box, you weren’t very fortunate with the smartness of some portuguese commenters. Be patient. Depois daquele subserviente pedido de desculpa, em que grupo te revês? Isso tem um significado. Mas também como já sabemos que és preguiçoso, se lhe juntarmos subserviência dá um QI baixo. Logo, cais no grupo a que julgas não pertencer. Encontramos na nossa história muitos que como tu tinham vergonha do país, era uma questão de não fazerem parte da populaça inculta e muito das coisas más que nos aconteceram foi porque alguns se viram de rabinho pró ar e facilitaram a vida de quem nos veio aqui fazer mal durante algum tempo. Mas atenção, cairam em desgraça, para nós eram os traidores e para dos invasores tiveram o despreso porque não há quem goste de espinhas moles. Endireita-te pá! aposto que és boa pessoa mas estás enganada. Admito mesmo que sejas fofinha e querida e muito amigo do teu amigo e tudo isso, mas continuas enganada. A única coisa por que pedi desculpa foi pelo meu sofrível inglês que uma preguiça congénita não me permite aprofundar. Quanto a desculpa, estamos assentes espero. O que me incomodou e continua a incomodar é a ignorância com os comentadores portugueses acima (há pelo menos um que não) viram uma imagem que está a nosso favor. Falas em subserviência quando devias estar preocupada com a ignorância abjecta dos nossos conterrâneos. Portugal não me envergonha, envergonha-me a miséria intelectual de muitos portugueses que apenas vêem ataques em todo o lado, mesmo em iimagens que pretendem denunciar injustiças contra nós, como a presente. Embora por motivos diferentes, acertas quando me recomendas para me me endireitar. Devido aos meus quase dois metros, tenho algumas dificuldades em não andar curvado. É me das ombreiras das portas. Se entendeste o que entendeste do que escrevi, mais se justifica o pedido de esculpas pelo inglês. Naturalmente, não me consegui expressar nesse idioma.